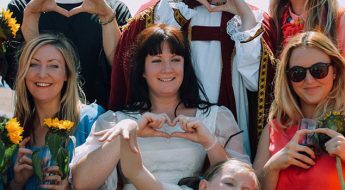 In May 2016 Sophie Tanner put a wedding dress on and took to the streets of Brighton & Hove to publicly marry herself. Since then, she’s been on national television explaining why exactly she did it, and she’s written a book about it. 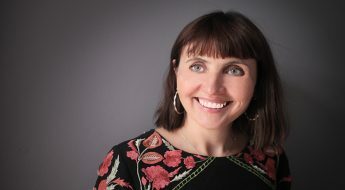 We had five minutes with Sophie to talk about the city and find out a bit more about the woman who helped drive a trend in self-marriage and the importance of self-love (even Cara Delavingne is on it). Where do you live in Brighton & Hove and what do you like about the area? I have a small flat in Kemptown village, it’s definitely my favourite place to live in Brighton – so chilled and friendly, with a village-y vibe and I’m just a few minutes’ walk from the beach. A couple of years ago you performed at the Brighton Fringe when you (quite memorably) married yourself. Did you actually propose to yourself? What led to you making the decision to marry yourself and would you recommend it? It was a proposal in the sense that I felt truly engaged with myself for the first time in ages. In my early thirties, I was lying in bed recovering from a break-up and a bad bout of flu and felt so relieved to feel my natural sense of optimism and happiness returning. I thought I’d lost myself for a while there and it was amazing to remember how much I enjoyed my own company. At that moment I decided to celebrate self-love in the same way other people celebrate love – with a wedding! I would thoroughly recommend marrying yourself – committing to face your disappointments, accept your failures and embrace your dreams in the presence of your loved ones is not something you regret! We hear you’ve been busy writing a book about it. How can we get our hands on it? Yes, I’m just finishing my novel Reader, I Married Me – it’s a light-hearted challenge to traditional romcom narratives, exploring why self-love is just as important as romantic love. I’ve always dreamt of having a book published and it’s been the most amazing journey and actually the hardest thing I’ve ever done. It’s coming out next year (2019), but you can pre-order it now. We’ve seen you’re part of the new self-love sessions that BelongCon are launching soon, can you tell us more about that? 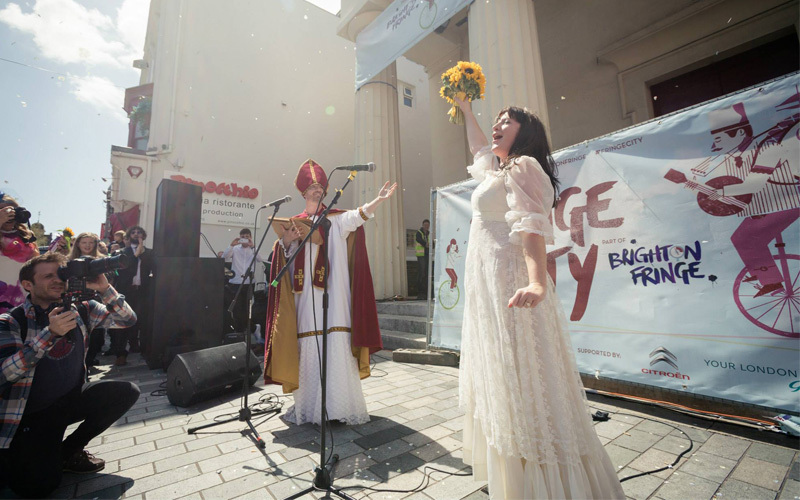 If you’re not renewing your vows to yourself at the festival this year, what’s been on your list to go and see? I’ve seen some awesome circus acts, NoFit State Circus was a favourite, and I’d like to catch some more drag shows – Courtney Act was an inspiration! I basically need to spend the whole of this weekend in the Spiegeltent, it’s the last weekend! 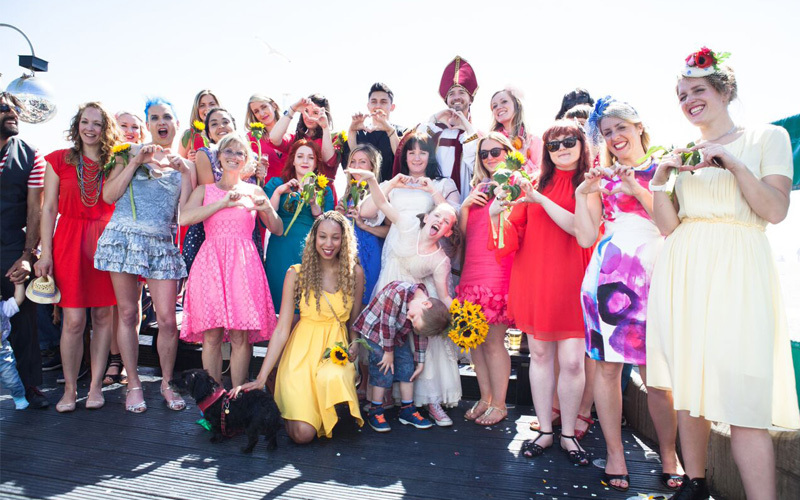 And finally, can you describe your perfect day in Brighton for us? Ooh, that’s a good question – do I have 24 full hours? Ok, it’s a blazing hot day, of course. I’d have a morning run with my dog down at Black Rock [near Brighton Marina], a beach BBQ and dip in the sea with friends. Then al fresco dinner somewhere with fine wine, a pub crawl in the many awesome pubs in the Lanes, then a bit of a rave at Concorde 2 and then, go on then, I’d finish up at The Volks… and perhaps a house party. I’ve probably used up all my hours by now, haven’t I? We know you’re all wondering how her wedding day went, so here’s a video of the big day back in 2016. Tickets for BelongCon: Summer 2018 on 11th July are on sale now (£10).